It would be easy to pull “The Angels Take Manhattan” apart for one little thing after another, and many people, no doubt, will. Even if they do, that doesn’t make it a bad or a weak episode, but it does point to how complicated this series has gotten over the years, much of it due to the heavy injection of romance. “Angels” is all about romance, though it wants to be about plot, too. Here’s where Steven Moffat has a tendency to trip up in his writing, because his aim is to deliver a big twisty-turny story alongside gushy-wushy emotions, and it’s becoming increasingly difficult for him to do both, especially where long term arcs are concerned. Classic Doctor Who didn’t have this problem, as it wasn’t cluttered with complicated feelings between its characters (or extended story arcs, for that matter). If the Doctor said he couldn’t go back and save Adric from being blown to smithereens, we believed him. There were certain laws of time that couldn’t or shouldn’t be broken, and it made perfect sense. Now we have a Doctor Who that not only features a godlike central character who appears to be governed by nobody outside of himself, but who’s also an extremely clingy, emotional being, desperate to hang on to his companion, possibly even at the expense of her own husband. So when the script puts him into the position of claiming to be unable to do anything about the situation Amy and Rory find themselves in at the close of this episode, it’s an almost impossible notion to swallow, because in any other episode besides this one, it would’ve been quickly remedied, probably with the wave of the sonic screwdriver. In the end, it all came down to a choice for Amy, which is a dramatically sound note for her to exit on, as her choices, or rather her continued decision to not choose, has been a hallmark of the last two and a half seasons. For her to have made any other choice would obviously have been wrong. It was an almost preposterously simple sendoff, and yet that simplicity is what made it work so wonderfully. Perhaps her previous choice to jump off the building with Rory even solidified her final decision. In any case, there wasn’t a dry eye in my house, and as companions exits go, this was one of the most understated and least grandstanding of the new series, which is possibly its greatest strength. Moffat returned to the original concept of the weeping angels: The notion of them feeding off of the energy of displaced time travelers, which dovetailed nicely into Amy and Rory’s sendoff. In hindsight, this makes some of the “innovations” he bestowed upon the Angels in the season five two-parter sillier than ever. Another issue that plagues Moffat’s writing is how gimmicky these types of monstrous creations are. The Angels are not a race that can grow or be explored in much detail. Make no mistake, it’s a wonderful gimmick, but not one that can probably be reinvented time and again over the long haul, like, say, the Daleks, who aren’t really a gimmick, but an exploration of the consequences of hate. The Angels were very, very good here, but still not as dazzling as they were in their first outing, “Blink,” and chances are they’ll never dazzle like that again; such is the limitation of this creature whose primary trait is that it can only attack when its victim isn’t looking. That idea doesn’t have much room to grow. The Silents have similar problems, which became more apparent the more we got to know them. We leave the Doctor, appropriately, with a question mark over his head, which is turning out to be a theme of the season, punctuated by that most obvious of questions, “Doctor who?,” which the series is getting loads of mileage out of. It feels as though Doctor Who is in the midst of redefining the character, as he’s learning to redefine himself. It would be silly for me to take stabs at where it’s all going, because I’ll inevitably be wrong, and frankly I rather enjoy letting the series wash over me from week to week, without trying to guess the batshit crazy directions Moffat intends to take the show. In order to avoid turning into a seething ball of pathetic fanboy bitterness, I’ve also forced myself into adopting some new strategies for watching this series, and part of that involves recognizing the show Steven Moffat wants to make, vs. the show I want to see. One of those is a realistic jumping off point from which to begin viewing, and the other is not. Perhaps Moffat even enjoys confounding viewers — giving them material to debate and argue and ponder and try to make sense of. One of the great things about Doctor Who fans is that if something doesn’t work right, or there are continuity problems, they’ll find ways to put it together so that it does make sense. There are plenty of moments in “The Angels Take Manhattan” that don’t make a whole lot of sense, but right now, someone, somewhere, has just found the perfect way to justify that thing that totally drove you up the wall. Since this is New York Magazine, New York’s place in this episode needs to be addressed. Honestly, it all felt very awkward, and poorly executed. Where were all of the people, in this city of a million stories – this city that never sleeps? No wonder nobody noticed the Statue of Liberty wandering around. Whether it was New York of 2012 or 1938, it all felt extremely desolate. The pulse of the city was all too obviously absent. The show did a much better job with “Daleks in Manhattan” back in season three, even though that story was arguably less engaging than this one. Likewise, the stock, guest characters were extremely forgettable, and the story seems as though it could just as easily have been told without them. 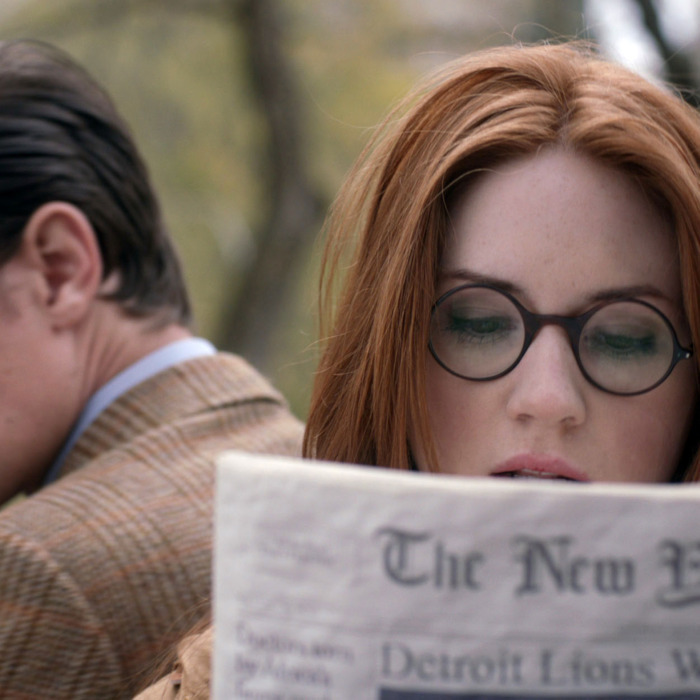 The eyeglasses looked quite fetching on both Amy and the Doctor. The cherubs were a triumph, and probably the only great addition to the Angel lore in the story. The Statue of Liberty? Eh, not so much. It worked splendidly the first time as a one-off gag, but it never should’ve been brought back for the pivotal scene atop the roof with Amy and Rory, at which point it lost all credibility, as the couple spent a good thirty seconds staring into one another’s eyes, at which point they should’ve been zapped. The Melody Malone book River ended up writing must have been one messy read, with characters coming and going with no regard to plot. Clearly, Amy must have published it herself, as it seems unlikely any sane publisher would’ve expressed an interest. Let’s give a warm round of applause to Rory Williams, who became far more of an audience identification figure over the past two and a half years than Amy Pond. Arthur Darvill’s ability to roll his eyes at precisely the right moments always made him someone with whom we could identify when the scripts went too far. Were I him, in that moment, I’d probably want to jump off a building, too. Finally, there’s Amy Pond, one of the most peculiar people to have ever traveled with the Doctor, simply because her life was almost completely defined by either his presence or absence. It is fascinating to ponder the life Amelia was forced into carving out for herself without him. It’s a story that we’ll wish we could know, but are probably better off imagining. That all-too-brief tease of the Christmas special, with Richard E. Grant looking malevolent in a way he perhaps never has before in his entire career. Moffat writes his Christmas specials to the hilt, and this one will hopefully prove to be no exception. See you back here on Boxing Day!